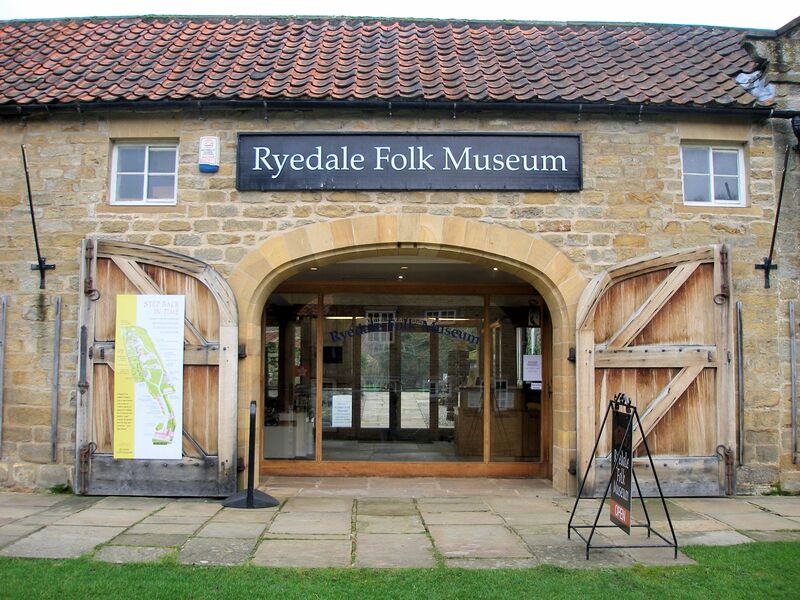 One of my favourite museums in the north of England is the Ryedale Folk Museum in the beautiful village of Hutton-le-Hole on the southern flanks of the North York Moors. It actually sits at the boundary of the high moors—a Jurassic sand and mudstone massif intercut by steep dales—and the limestone escarpments known as the tabular hills with dry valleys and, today, rich agricultural land where the small rivers often divert underground before re-emerging on the northern flanks of the Vale of Pickering. Both landscapes and environments are man-made over the last 11,000 years. 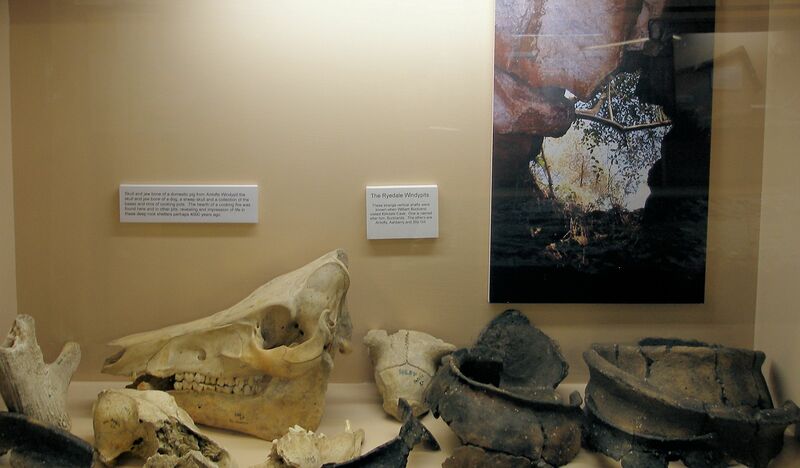 Their fascinating geology, topography, fauna and flora have influenced human exploitation and settlement over the millennia. Needless to say, the area as fantastically rich in archaeology. All photographs by kind permission of the museum. Apologies for some of the poor quality, due to internal lighting conditions. 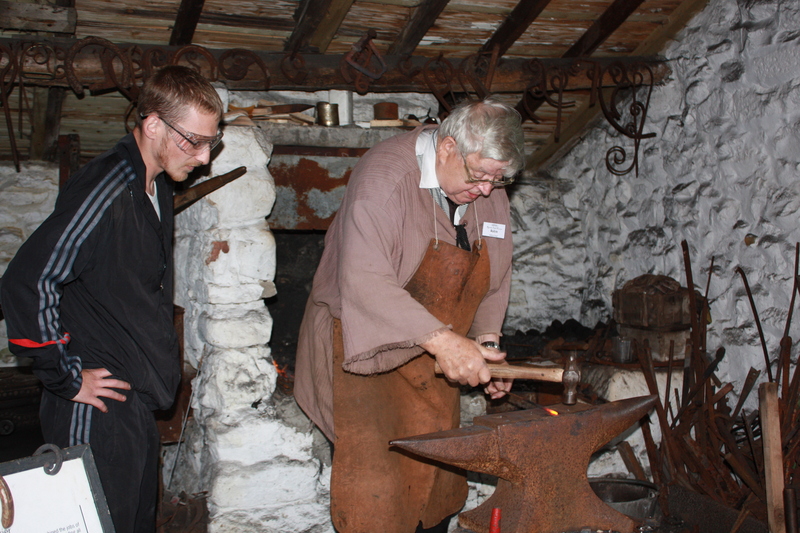 The Museum, established in 1964 by Wilfred Crosland, Bertram Frank and Raymond Hayes (left in the picture→), brings together an eclectic mix of historical structures and artefacts, including re-located medieval buildings, shops, a smithy, a loo, an early photographic studio and the paraphernalia of rural life through the 18th century to WWII. 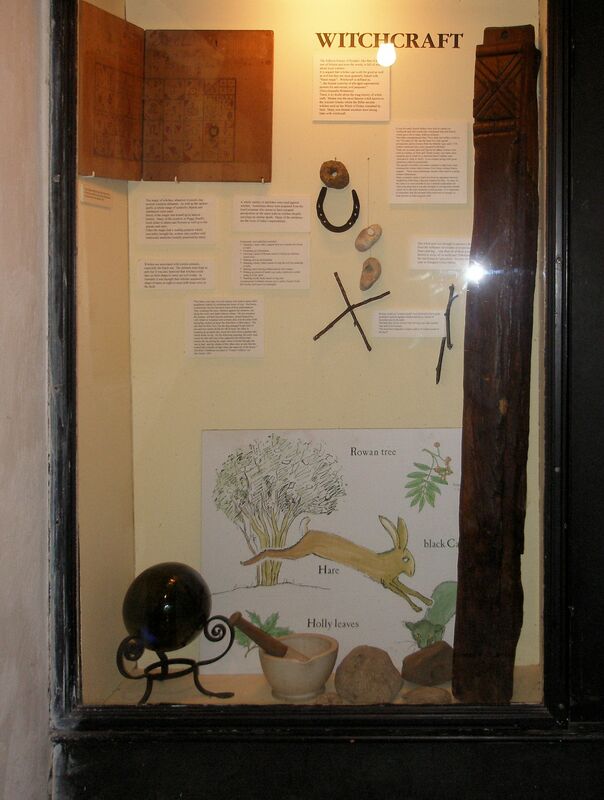 The folklore, captured by the Rev J.C. Atkinson of Danby (Forty Years in a Moorland Parish, 1891) in the mid-late 19th century and Dr Frank Elgee (diaries) in the early 20th century, is evidenced in the “witching” post and other superstitious objects. Raymond Hayes (MBE, FSA) moved to the village in 1925. He was a particularly fascinating and friendly character, a quiet and modest man, generous with his time and interest, who combined photographic skills learnt from his father with his role as postman (on skis in harsh winters) and interest in the region’s archaeology. 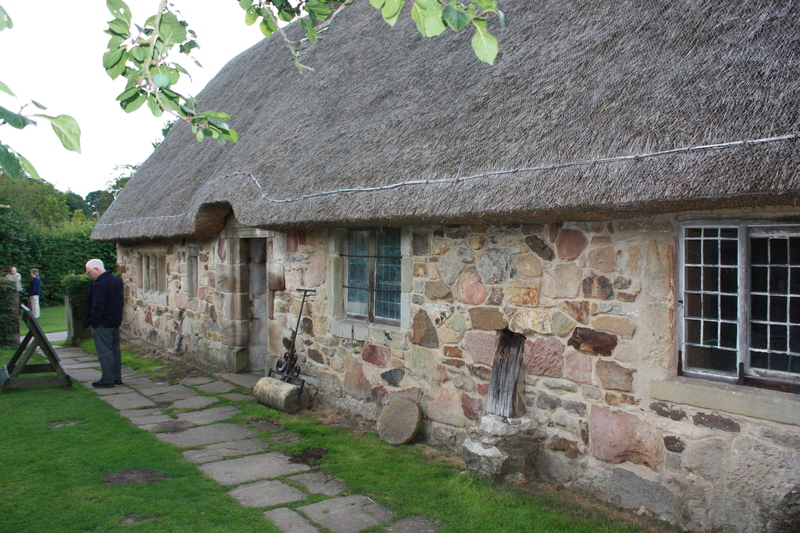 Much of what resides in the museum collections, archaeologically, reflects his fieldwork and that of his friends, such as Rowland Close of Baysdale. Raymond was also an assiduous correspondent with the Ordnance Survey—adding and amending many historical and archaeological features of the moors and Vale of Pickering. While we can thank him for the accuracy of OS maps, his countless entries in the annual Archaeological Registers of the Yorkshire Archaeological Society and the Scarborough & District Archaeological & Historical Society reflect his attention to detail and deep local knowledge. He was extremely helpful in offering me advice in 1985-86 on my archaeology dissertation and would often treat me and his visitors to a proper Sunday roast! 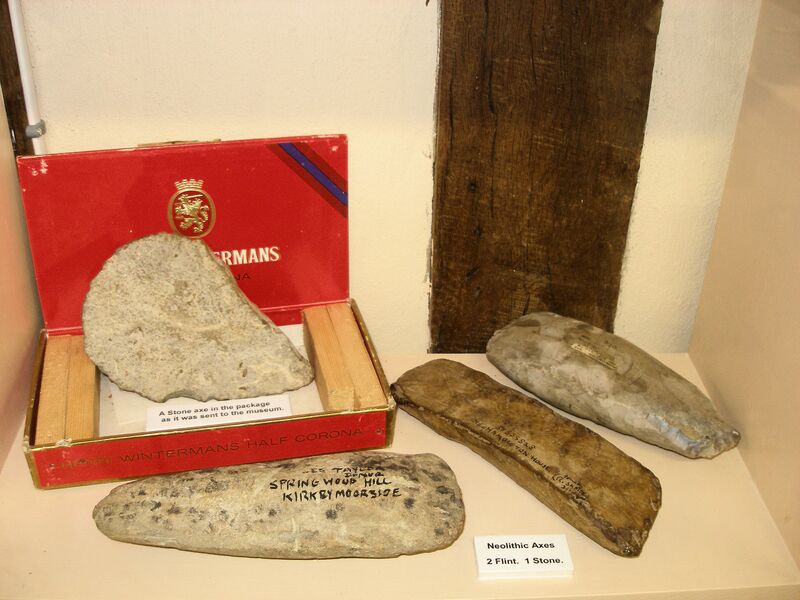 It’s been quite a number of years since the archaeological collections have been displayed at the museum. 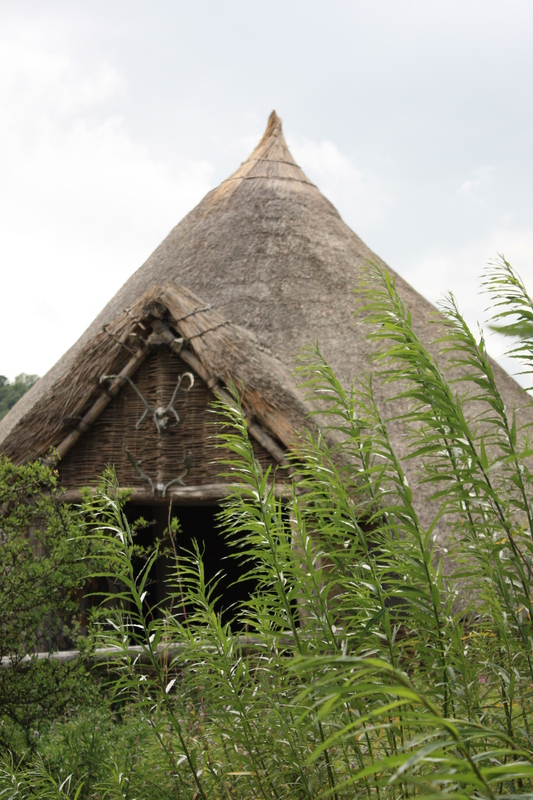 However, in the meantime, a very fine Iron Age round house has been reconstructed—a vast structure that gives a real sense of late prehistoric life and is especially evocative during the summer months. 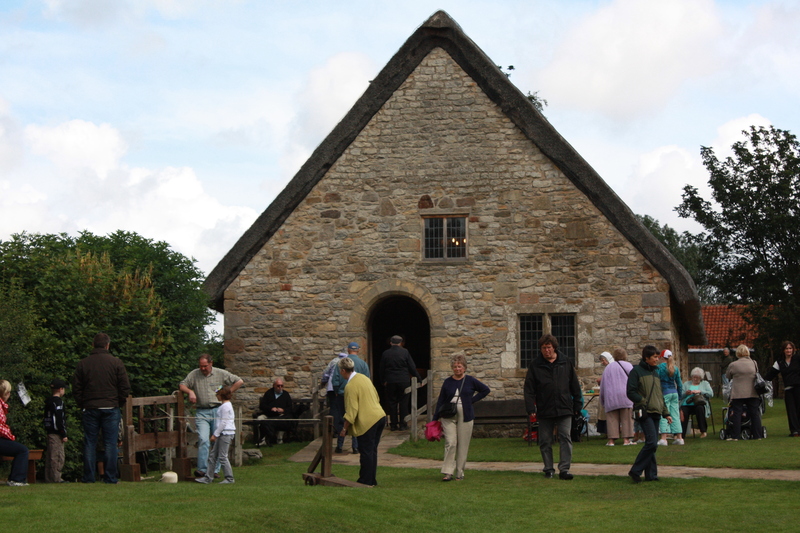 Image ↑ | The Manor House where the archaeology is back on display. 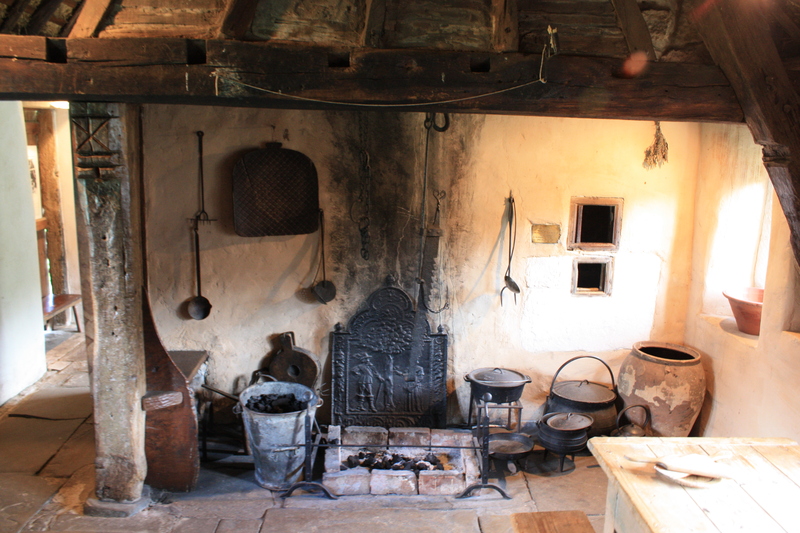 The intention here is only to offer a taster of what’s on display. 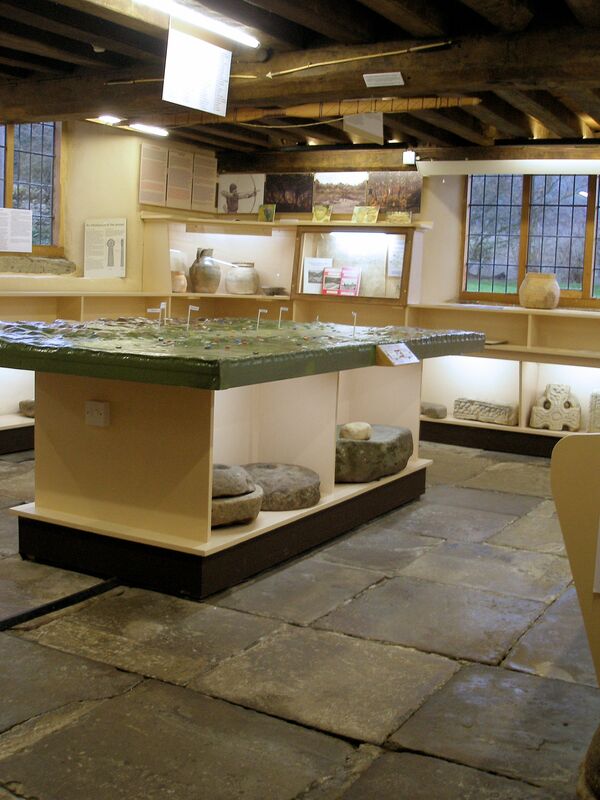 It has been enthusiastically put together by museum volunteers and reflects the diversity of archaeology in the area. In its presentation it is as eclectic as the museum’s collections overall. The images presented around the wall combine both contemporary visualisations as well as an entertaining array of 19th century views of our ancestors—there’s a kind of internal historiography going on here too. 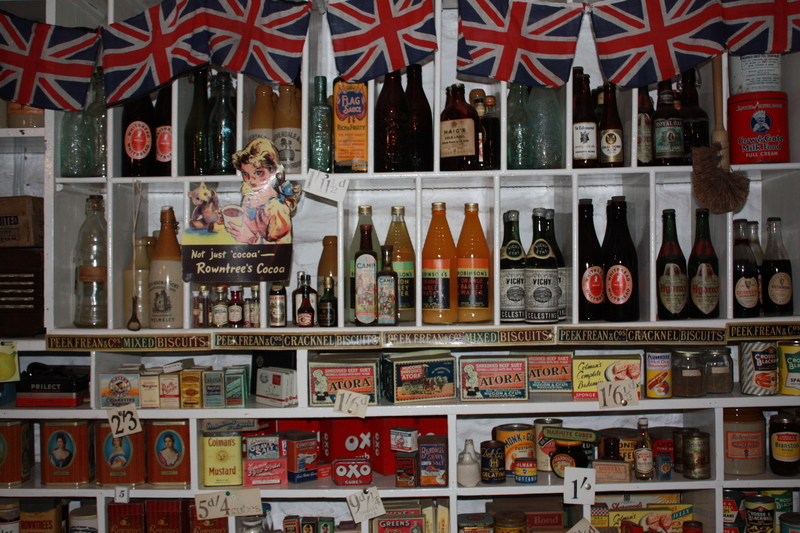 Equally, there isn’t necessarily a chronological order to the displays and I think that plays to the sense of curiosity more than a transcript of a period-by-period narrative—I suspect that this will work better for children. 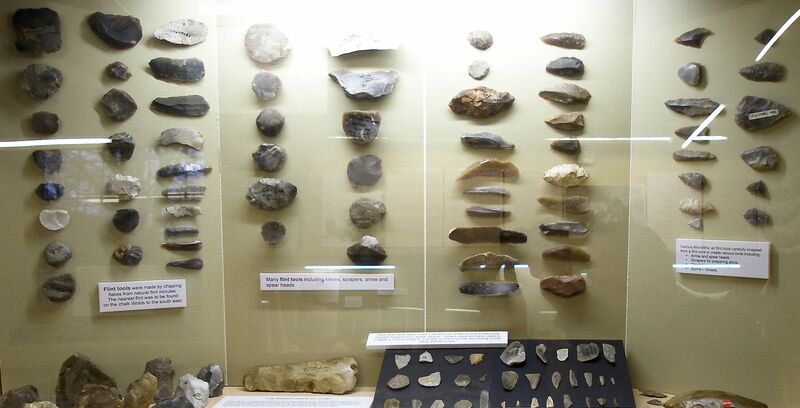 The extensive lithics reflect the use of flint and stone from the Mesolithic through to the late Bronze Age (I couldn’t spot a gun flint from the 17th–18th centuries but they are a frequent find). 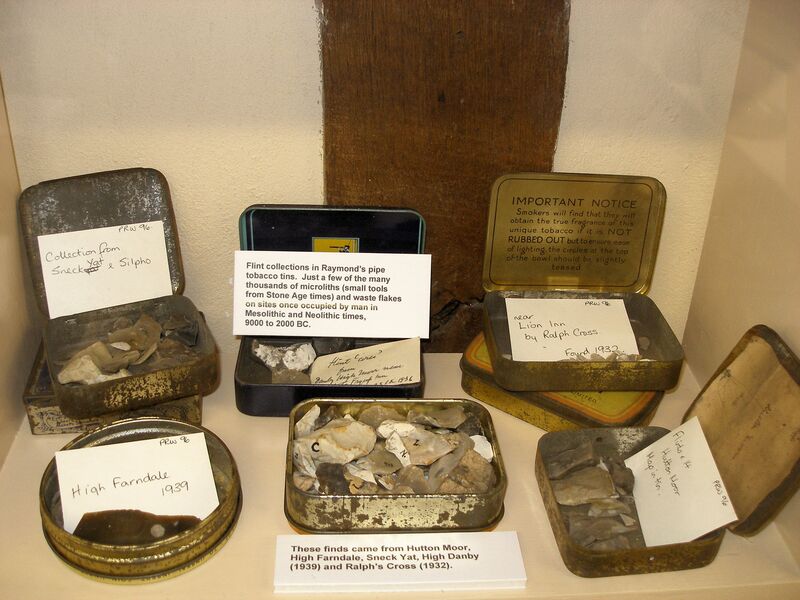 Early collectors, including Raymond, would often store their finds in old tobacco tins and match boxes, and these add an antiquarian aspect to the displays. Raymond’s hand-written labels are everywhere to be seen. 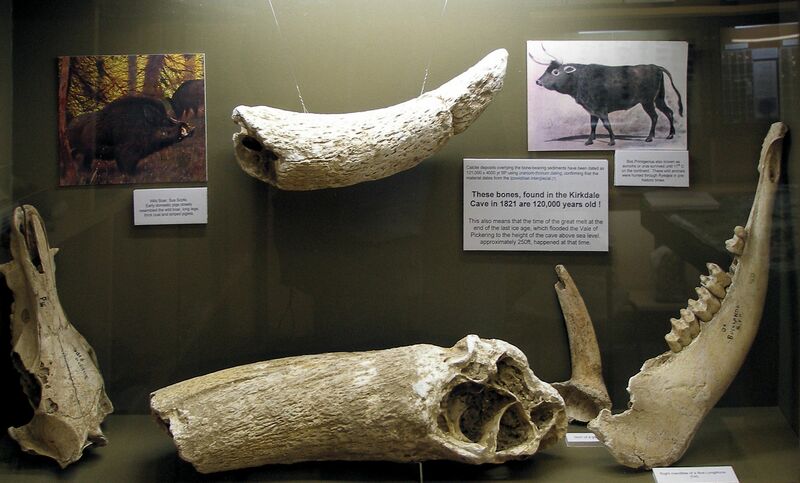 Kirkdale Cave was discovered in 1821 by limestone quarrymen who recovered an enormous number of bones and teeth from animals such as elephants, hippopotamuses, rhinoceroses, hyenas, bison and giant deer. 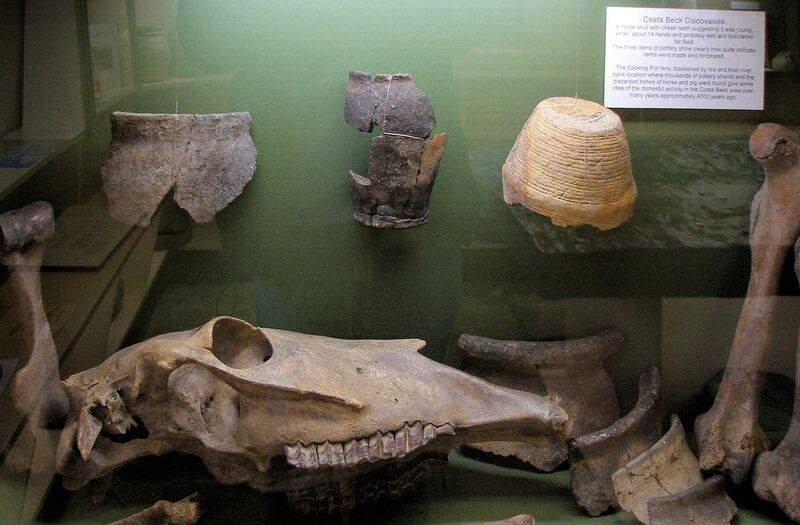 The Pleistocene fauna dates from around 120,000 years ago (also collections in Whitby Museum and the Yorkshire Museum). 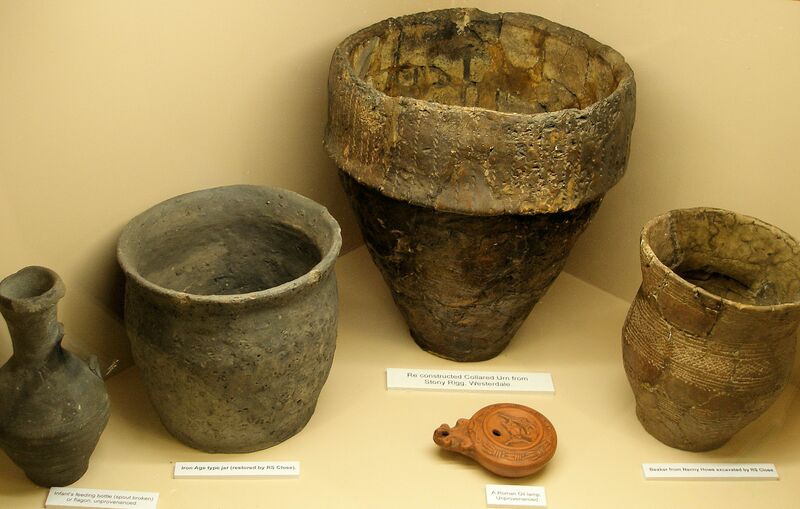 Prehistoric pottery includes a Late Neolithic-Early Bronze Age beaker (right), Bronze Age collared urn (back centre) from excavated barrows, an Iron Age vessel and Roman pottery. Finds from the “Windypits” near Rievaulx and Helmsley date from the Late Neolithic to Early Bronze Age (beakers and flints). 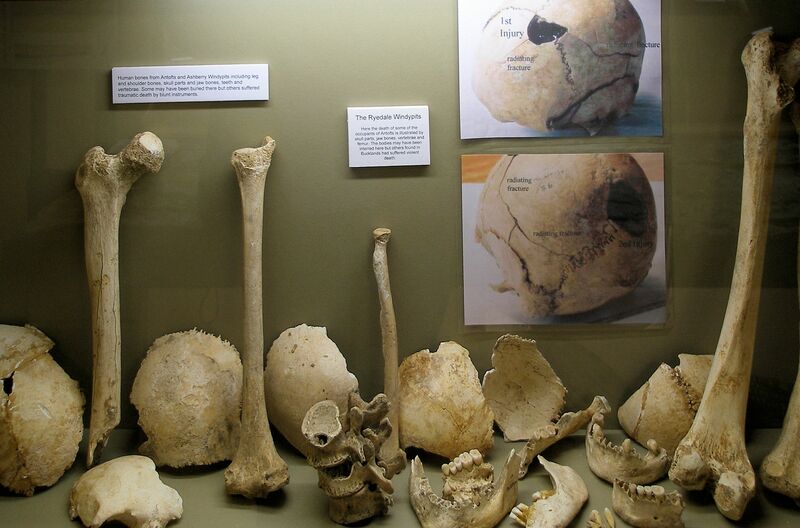 However, human remains include evidence for physical “blunt object” trauma to skulls and at least one example of scalping in the Roman period. Windypits are geological fissures that, due to updraughts, emit warm or cold air and condensed vapours—a very strange prospect especially when it makes adjacent vegetation vibrate. 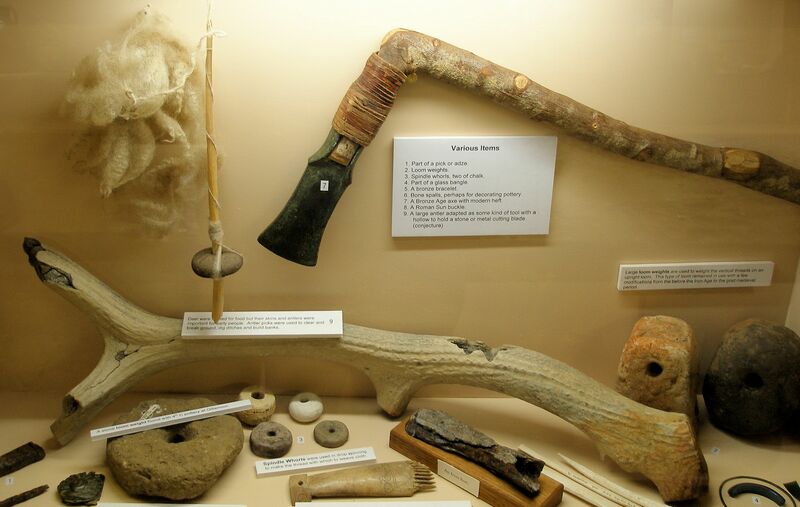 Costa Beck, near Pickering, is a waterlogged area where Raymond recovered, with the help of a loaned dinghy, a large assemblage of bone, antler and pottery dating to the late Iron Age and early Roman periods and records of timber piles. Butlin, R.A. (ed.) 2003. Historical Atlas of North Yorkshire. West Yorkshire: Westbury. Radley, J. 1969. 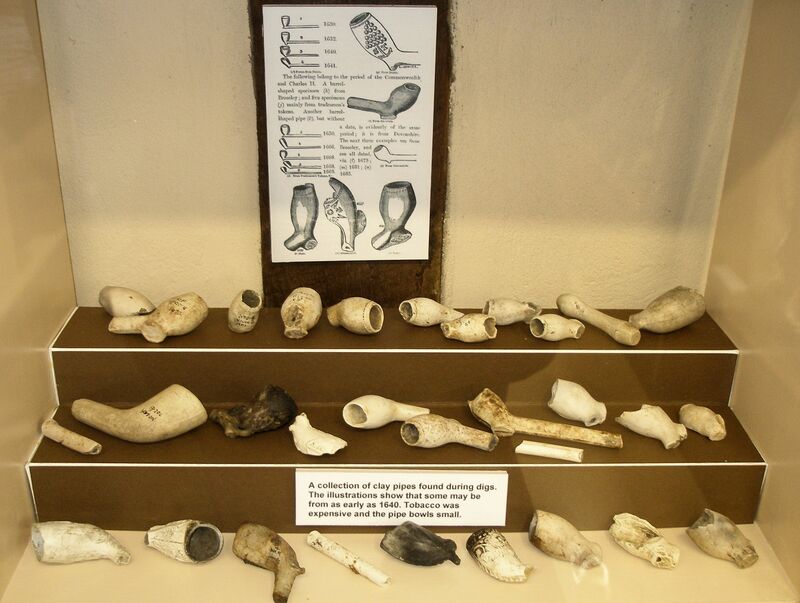 The Mesolithic Period in North-East Yorkshire. Yorks Archaeol J 42: 314-27. Spratt, D.A. (ed.) 1993. 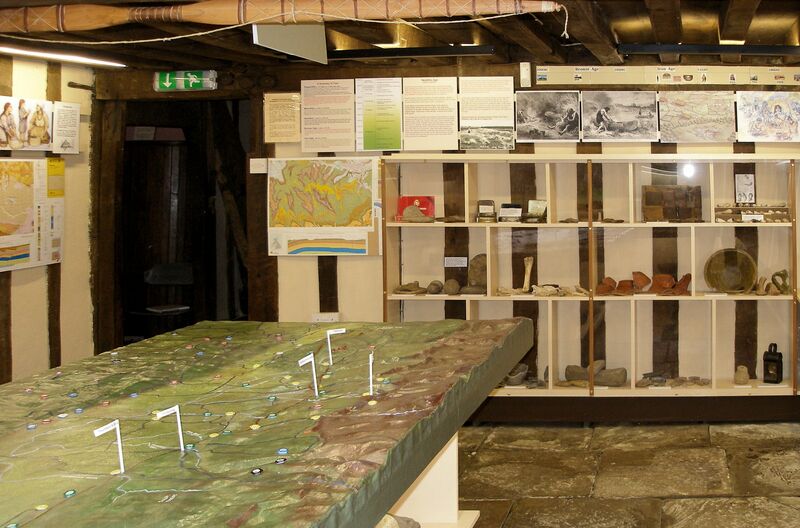 Prehistoric and Roman Archaeology of North-East Yorkshire. CBA Res Rep 87. London: CBA. Wilson, P.R. (ed.) 1988. North-East Yorkshire Studies: Archaeological Papers by Raymond H. Hayes. Leeds: Yorks Archaeol Soc Roman Antiq Sec. 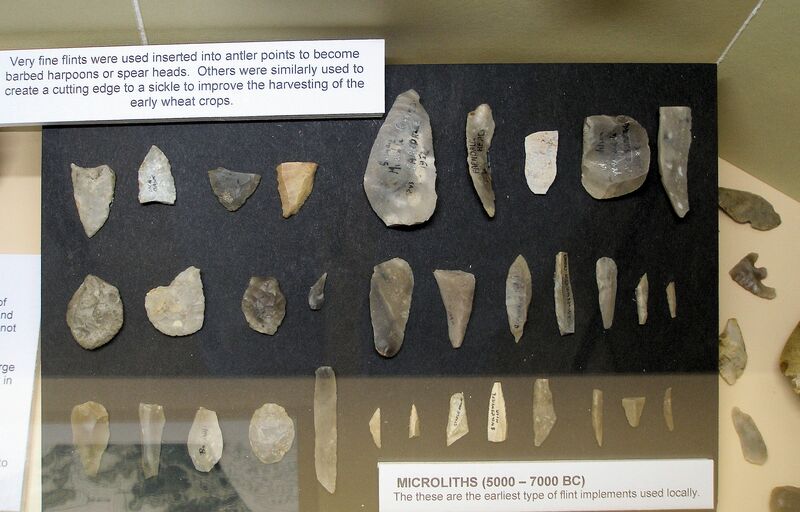 This entry was posted in British archaeology, Mesolithic, Microburin miscellaneous, Sites and finds and tagged Archaeology, flints, Museums, North York Moors, Prehistory, Ryedale by Spencer Carter. Bookmark the permalink. Hi Spence, my erstwhile favourite museums had displays like this; eclectic, modern and antiquarian at the same time, varied with no apparent structure or story, but fascinating and entertaining. Always nice to hear about collections being made accessible again. Me too – it used to be a bit of something for everyone. This time it’s more focused on local material, plus a bit of Samian ware from Catterick – I forget who it was last century that left them a large Roman collection. Pannett Park in Whitby is still the VIctorian menagerie it always was – a delight of Victorian curiosities!